Having enjoyed a watching the alice in wonderland ballet, we could think of nothing more fitting then enjoying a spot of Alice In Wonderland themed Afternoon tea exclusive to The Sanderson Hotel. The Sanderson is a five star luxury, boutique hotel located just off Oxford Street (London, England). This hotel really is unique, and oozes its own super cool attitude. The main lobby is spacious with bold decor including a lips sofa and a hanging 60's chair. We could not think of a more appropriate location for an Alice In Wonderland afternoon tea. 'The Mad Hatters Tea Party' is held in an inside garden, with a big clear rooftop. The setting is really beautiful and tranquil with lush greenery, lanterns ,flowers and mini waterfalls. It is very easy in such an environment to forget you are in the middle of bustling London. Our waitress smiled warmly and showed us to our intimate table, before presenting us with a cocktail menu. This afternoon tea offers guests a choice of a cocktail or glass of champagne alongside a pot of tea which is a nice novelty. Chelsie: As we sat sipping our cocktails we were unsure of quite what to expect. When the afternoon tea stand arrived we were taken aback. The tea was beautifully presented in a three tier stand, with a tea cup on the top tier. This afternoon tea looked too pretty to eat! Kate and I giggled as we felt so bad about indulging in this afternoon tea as it would ruin the beautiful layout; we did however make sure we took numerous pictures to show to our viewers before diving in! The Afternoon Tea Food Breakdown: 'Rainbow sandwiches' which included yellow saffron bread with ham and English mustard, green spinach bread with smoked salmon and cream cheese, cucumber and black pepper on beetroot bread and egg mayonnaise and cress on brown bread. These were all finished admittedly in record time! Then onto the stand itself the top layer, which we were advised to enjoy first consisted of a blueberry lollipop which was double sided; lick on one side your mouth becomes cold, lick the other your mouth becomes warm and a hazelnut praline ice cream exploding lollipop- My favourite and simply summed up wow! The middle tier of the stand offers both plain and fruit scones, with strawberry jam and clotted cream to accompany them. The bottom row was mine and Kate's favourite with three iconic Alice In Wonderland symbols being transformed into mouthwatering desserts. The first is a little bottle, with a 'Drink Me' label around its neck, each sip a different flavour. The distinct flavours are apple pie, lemon curd and English Toffee. 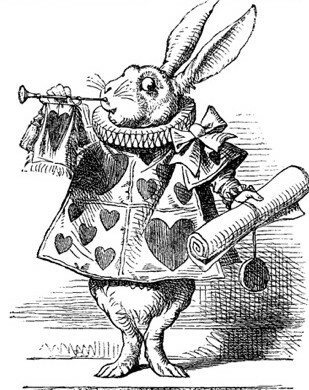 The next dessert is none other then the white rabbits pocket watch, a chocolate and coffee layered sponge cake, and finally the Queen of Hearts 'Eat Me' encrypted strawberry and cream mousse. Trust me all of them leave you weak at the knees. After such indulgence we sat and sipped tea recovering from a taste bud overload. Kate: The Afternoon Tea tasted as good as it looked! The entire tea was an infusion of colours, tastes and sensations making this an unmissable afternoon tea and without doubt one of my favourites. One of the most enjoyable aspects of this tea, was simply the ability to without sounding too cliche take a few hours out of the bustle of everyday life and enjoy beautiful scenery and food in Wonderland. I will defiantly be returning to the Sanderson Hotel for another Mad Hatter Tea Party. The Mad Hatter's Tea Party is an amazing experience! The afternoon tea is reasonably priced, in light of the surrounding and quality of food. This afternoon tea is perfect for a girly get together, ideally a group of friends or for any Alice In Wonderland fanatics like ourselves! 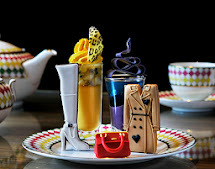 The Sanderson Hotel has successfully managed to offer something completely different to many of the other afternoon teas available at numerous locations and for this reason we think this tea is unmissable and is a defiant must this Spring or Summer! P.S Do Not Forget Your Camara! !